Steam the Chinese Broccoli for 10-15 minutes. Fry the sliced garlic and shallots until golden brown or fragrant, remove and set aside. Use the same frypan, add in oyster sauce and soy sauce. 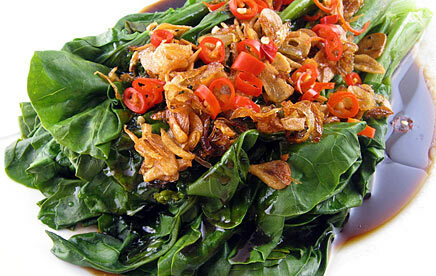 Remove Chinese Broccoli from water, arrange in a plate. When the sauce is bubbling, remove from heat and slowly pour over the Chinese broccoli. Sprinkle fried scallion ,garlic and cut red chili pepper on the top.